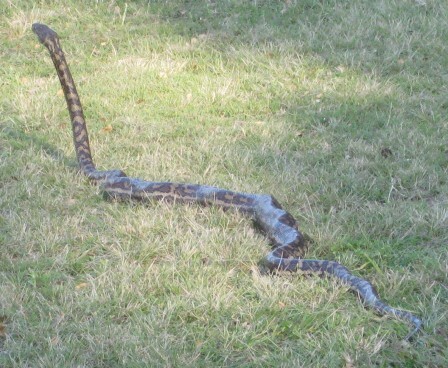 The unseasonal hot weather in Queensland this winter has brought the snakes out early — this photo was taken on 4 August! We spotted this carpet python in the grass near some children’s play equipment at our local park in Brisbane. By my guess the carpet snake was around 2 metres long. The snake was a little slow as it was not really warm enough for it to have come out of hybernation. We took a couple of photographs and left the snake alone. The snake eventually slithered off into the bushes and did not worry anyone. This entry was posted in House & family and tagged Random on 4 August 2010 by Rex. I’m a blogger personally and I observed your article that they are extremely fascinating and original. Great job for this article, and I’ve just became subscribed for the blog. Hope you do the same for me. One that doesn’t allow you to die completely.” Die? As she moved to climb up the beasts fell over, crashing by way of the railing.